Above and beyond simple connectivity management, customers may ask of their Service Providers that they provision multiple traffic streams across their Ethernet 'pipe' connections, to which potentially different criteria may apply for key network performance parameters, including acceptable frame loss ratio, traffic delay and delay variation, together with comprehensive traffic throughput 'policing'. 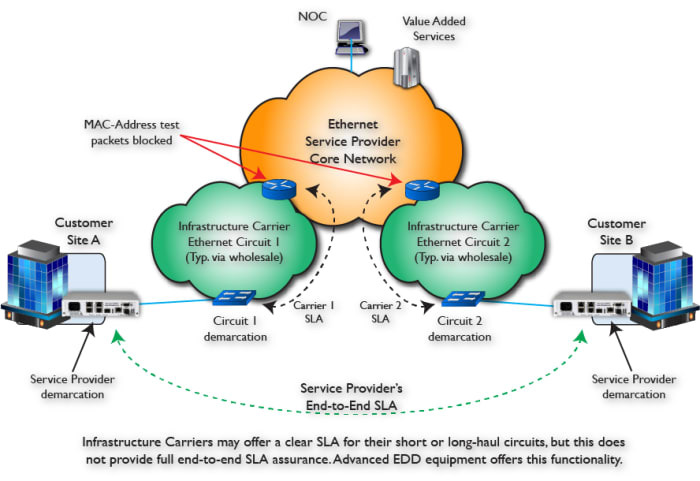 Providers may then be faced with the challenge of proving to their customers, at the time of provisioning, that such performance parameters are complied with for each individual Service data stream within a given end-to-end Ethernet connection. Such parameters may be detailed within a tightly defined Service Level Agreement (SLA). The SLA is a commitment to a service level provided by a Service Provider (Organisation 1 below) to its Customer (Organisation 2 below) expressed in a contractual document. 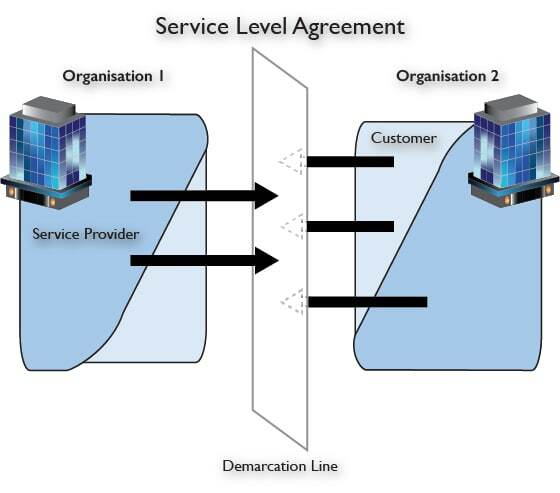 It generates a Demarcation Line between the Service Provider and Customer for both to be able to allocate their necessary resources, process and capabilities to fulfil this agreement, as illustrated below. Furthermore, Service Providers may not only need to demonstrate SLA compliance at the time of commissioning, but they may be required subsequently to monitor 'in-service' traffic and take pro-active remedial steps with regard to any potential breach of SLA. This is done by using the advanced packet processing capabilities of the Ethernet Demarcation Devices (EDD’s) to identify parameters that fall outside of the agreed SLA and alarm them to the network control centre or directly to the customer depending on the way the EDD is configured. All of these capabilities, incorporated within the most recent generation of advanced Ethernet Demarcation Devices, ensure that Service Providers’ customers get what they pay for and can prove it.